The Safari has always been a macho and butch looking vehicle. This takes it to another level though. It has been kitted out to be good off-road, and it shows. To begin with, the car is sitting on massive concave rims. 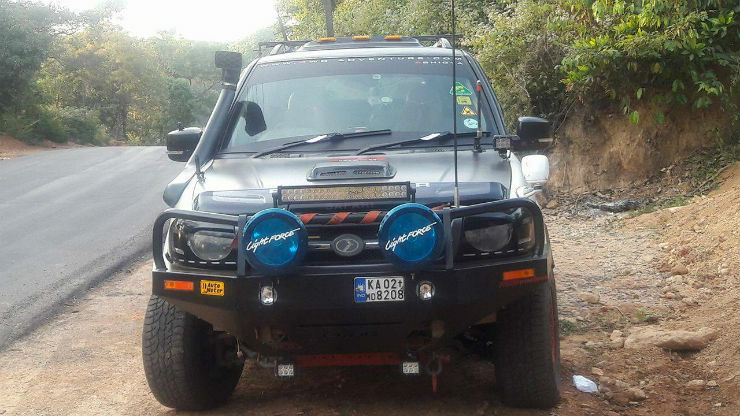 The front bumper has been replaced with an off-road metallic one courtesy ARB. It has the provision of a LED light bar and Light Force fog lamps. To improve the fording depth, the owner has fitted a snorkel onto the SUV. To improve the ground clearance, the vehicle has been fitted with a 2″ lift kit and an after market suspension. The 2″ helps to improve ground clearance and at the same time doesn’t make it look very tall. 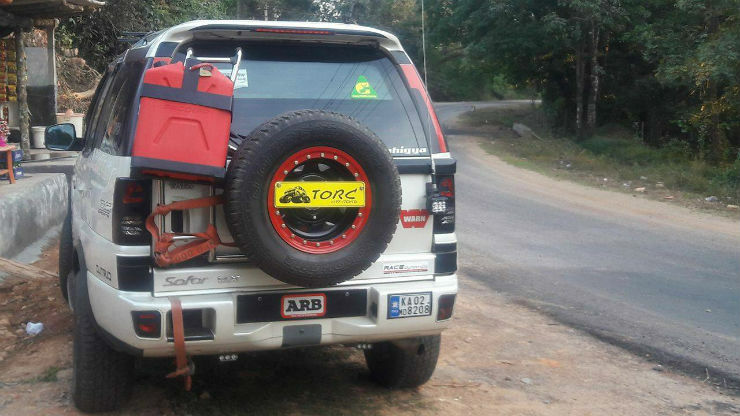 At the back, the owner has attached a ladder to climb onto the roof and also attached a jerry can for fuel, which is very useful while going on off-road trails. Roof rails have also been installed and the roof now has LED lights on them. There is a camo wrap that has been installed on the sides of the car and all the lights, pillars and the bonnet have been blacked out. The Safari came with a 2.2 liter Dicor engine on offer previously (it continues to sell even now). The engine produced 138 Bhp and 320 Nm. This particular one came with the 4wd system. Though 138 Bhp is good, this one has been remapped and now produces a massive 165 Bhp and 400 Nm. This is on par with the amount of torque the Varicor 400 makes, however this makes 10 more Bhp. It has the go to match the show as well.